Our comprehensive range of door insect screens consists of roller screens, sliding screens, hinged screens, fixed screens, lift off screens and strip curtains. This wide selection of insect door screen types together with a variety of mesh fabrics and profile colours means we will have the perfect insect screen for all domestic and commercial environments. Primarily designed for light commercial use and a less expensive alternative to the Nova hinged door screen. 28mm x 16mm extruded aluminium frame. Central mid bar for additional strength. Aluminium bottom kick plate for strength. Removable lift off PVC hinges. Available with Fibreglass (18 x 16) Charcoal Mesh (other mesh types available). Standard frame colours are white or brown. The Nova is a more robust screen than the Regal and is designed for light to medium commercial use. Medium gauge 30mm x 24mm extruded aluminium frame. Central mid bar for added support. Standard profile colours are white or brown. 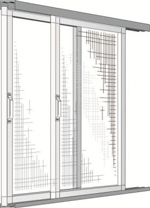 The Premo is a commercial hinged door screen which is designed for heavy commercial use. 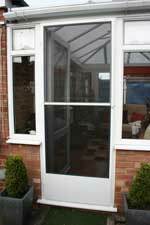 The screen is face fixed to the existing door frame or to a previously installed sub-frame. Heavy gauge 52mm x 24mm extruded aluminium frame. Heavy duty upper 8mm push plate. Heavy duty 8mm bottom kick plate for strength. Adjustable and removable steel hinges. Magnetic catch or steel ball closer. Available with Suntex heavy duty (17 x 12) Charcoal Mesh. Premo is available in white profile only. Custom colours are available as a special order at an additional cost. 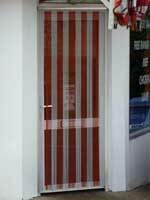 The free flow walk through Suntex mesh strip curtains are ideal for light commercial use. 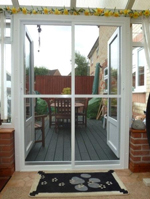 Option of 57mm lift off PVC or 35mm stainless steel suspension rails. 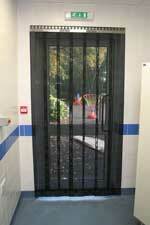 More cost effective than traditional hinged door screens. 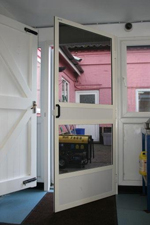 Designed and recommended for face fitting installations direct to existing door frame. Polyester strips are available in 150mm width with one sewn in stainless steel weight. 200mm width with two sewn in stainless steel weights. The free flow walk-through Chain Link curtains are ideal for light commercial or domestic use. Available with anodised silver aluminium 50mm face fitting suspension rail and standard anodised silver chain. Available with anodised silver aluminium 50mm face fitting suspension rail and solid coloured or striped anodised aluminium chain. Choice of eight metallic colours – silver, blue, red, green, black, pewter, bronze & yellow, gold. The free flow walk-through PVC strip curtains are for light pedestrian commercial use. Stainless steel hooked suspension track. 200m x 2mm normal temperature PVC clear strips with metal plates. Single red warning strip available for each end if required. 300mm and 400mm strips available for Cold Store use. Primarily designed for door reveal fitting installations and suitable for commercial or domestic use. Simple to use robust design that will last longer than any retractable roller screen and is available with many alternative mesh types. Four sided extruded aluminium 49mm x 13mm outer frame. Single robust removable inner pane. Inner pane has mid-bar for added strength. Panes easily removed for cleaning and maintenance. Nylon 35mm brush strip seal supplied with inner pane. Fibreglass (18 x 16) Charcoal Mesh (Other mesh types available).